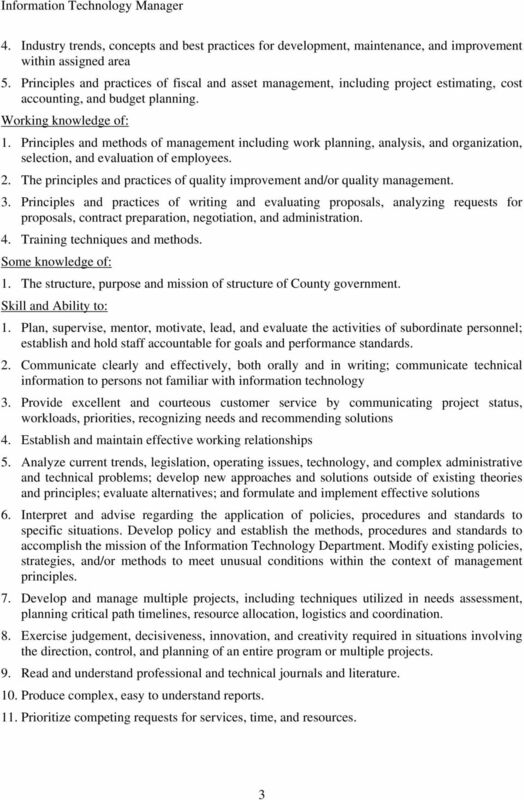 Download "Monterey County INFORMATION TECHNOLOGY MANAGER"
1 Monterey County 43G01 INFORMATION TECHNOLOGY MANAGER DEFINITION Under general direction, plans and directs the activities of operational programs within a division of the Information Technology Department, which has critical impact on County services and functions; and performs other duties as assigned. 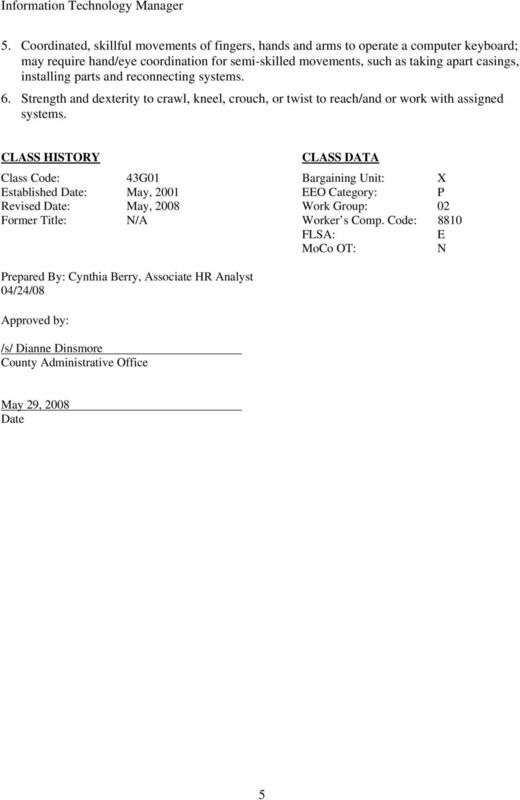 DISTINGUISHING CHARACTERISTICS This management level classification in the Information Technology Department manages professional, technical, and supervisory staff, and has overall program and asset management responsibility for an enterprise operational program including computer operations, network operations, radio systems support, telecommunications, special projects or system architecture. Incumbents manage the planning, acquisition, deployment, operation and support of technologies to which they are assigned, including: telephone systems and networks, data networks, radio and wireless systems, data center equipment and facilities, and general use computing hardware, software and services. Incumbents must possess specialized knowledge of the specific operational area to which they are assigned. 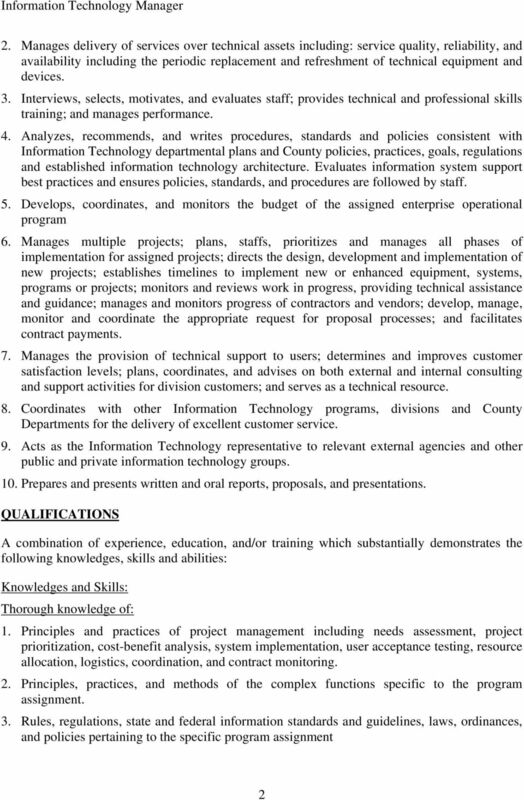 Information Technology Manager is distinguished from the next higher class of Assistant Director of Information Technology in that the latter is responsible for overseeing a division consisting of a group of operational programs, policy implementation and inter-disciplinary coordination as opposed to management of a type of technology and its associated services. Information Technology Manager is distinguished from the Information Technology Business Manager in that the latter focuses on the delivery of technology infrastructure issues and the supply of information technology services from the Information Technology Department to support the business needs of an assigned client department group whereas the Information Technology Manager focuses on the management of a particular technology and the efficient operation and support of that technology s assets. 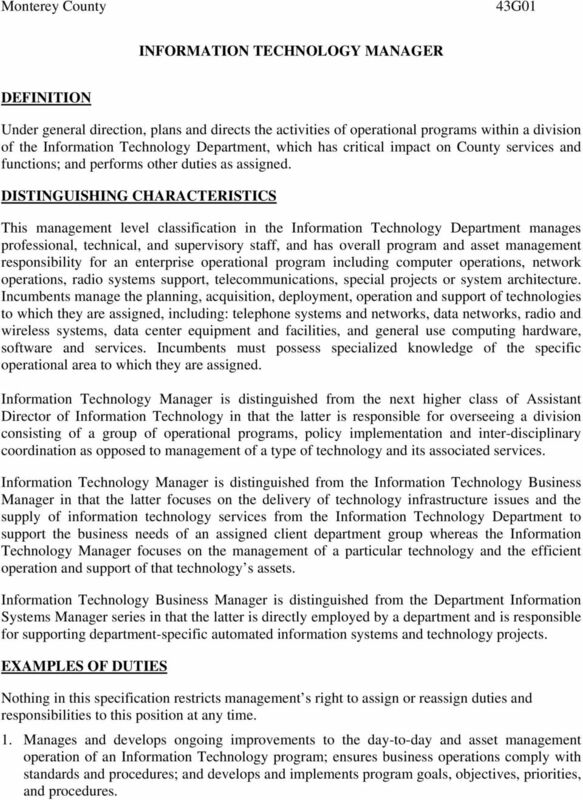 Information Technology Business Manager is distinguished from the Department Information Systems Manager series in that the latter is directly employed by a department and is responsible for supporting department-specific automated information systems and technology projects. EXAMPLES OF DUTIES Nothing in this specification restricts management s right to assign or reassign duties and responsibilities to this position at any time. 1. 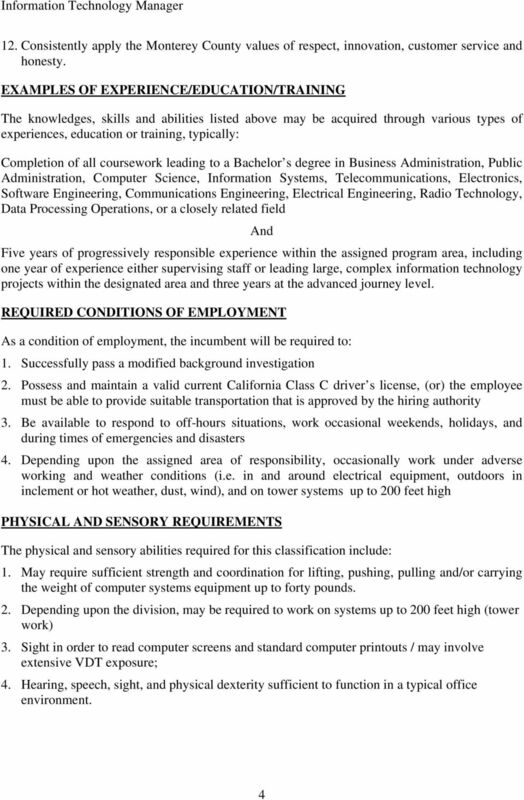 Manages and develops ongoing improvements to the day-to-day and asset management operation of an Information Technology program; ensures business operations comply with standards and procedures; and develops and implements program goals, objectives, priorities, and procedures.